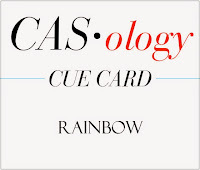 This week's CASology Cue Card is Rainbow! I love using the full rainbow of colours! But when we make CAS cards, we usually limit our colour palette. The trick with using lots of colours for a CAS card is to make sure there's LOTS of breathing room. I used my new Impression Obsession heart border die and an old Stampendous sentiment. 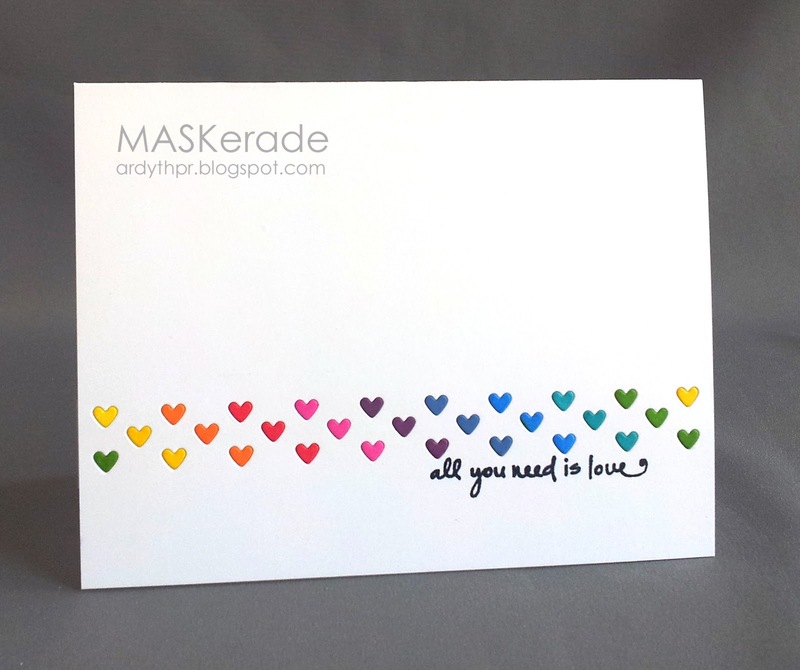 I cut it out, coloured each heart and then laid them back in to the card front, in rainbow order (I took some liberty and added a couple since there were 9 'rows' in this rainbow). Now it's your turn - I can not wait to see the colourful gallery this week - you guys always impress me, but when it's my favourite cue card (I really think this is probably my favourite one ever! ), I just know you're going to blow me away! Oh those mini hearts are just too sweet Ardyth. LOVE this, Ardyth! Sweet as can be! Aww...this is so sweet! Love! Fabulous card. Love all those tiny hearts. This is so darn cute! You seriously colored all the wee hearts? Truly a labor of "love". I'm thinking that a "9 row" rainbow works! What a lovely design--love how you went along the diagonal--and how long did it take to color all those hearts--brilliant. I know you love rainbows and wonder did you choose the cue word this week. I looked up rainbow on google and it said one color was indigo and I only guessed it was a blue (like jeans). Another fun card by Ardyth. I can't believe you coloured all those hearts in! I thought they were coloured cardstock. Such an awesome way to portray a rainbow! Your card is delightful and fun. Love the rainbow hearts - great design! That is some amazing patience. Those tiny hearts are so sweet and look fabulous in a rainbow palette! I also love that you didn't start with red for your rainbow. I never think to start with a different colour but I always love it when I see it. Your tiny hearts are the sweetest! You've done it again!! This is stunning and absolute CAS perfection. Oh Ardyth, this is just so perfect for this week's cue card! Those hearts are just too sweet! Ardyth, those tiny rainbow-colored hearts are so adorable! I can't imagine how long that took...but well worth the effort! Wonderful as always Ardyth, you have some patience to it and colour all those tiny hearts!